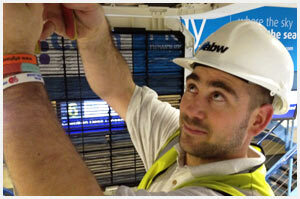 Installations - ABW Airconditioning – installation, commissioning, service and maintenance of all types of air conditioning. Air conditioning has developed as a highly efficient means of either heating or cooling an environment and with the use of inverter technology there is the ability to make large savings on energy bills. Whether you are looking to take the heat out of a summer’s day or put the heat back into your winter, there is almost certainly an air conditioning heating system to meet your needs. Split Air Conditioning Split type air conditioning systems are the simplest form of air conditioning installation consisting of one internal fan coil connected to an external condenser unit via small bore insulated copper tubing and electrical cabling. Indoor fan coils are available in a variety of forms providing a great level of flexibility and the ability to cater for a vast range of environments. The fundamental of an air conditioning system is the use of a Refrigerant to absorb heat from the indoor environment and transfer it to the external environment. Or in the case of a ‘Heat Pump’ system there is a reverse cycle enabling the absorption of heat from the external environment and using this heat to raise the internal temperature. Multi Air Conditioning. A multi type air conditioning system operates on the same principles as a split type air conditioning system however in this case there are ‘multiple’ internal units connected to one external unit. These systems are suitable where there are a number of small rooms that require conditioning with limited space externally to position the condenser unit, they are also a good means of maintaining the aesthetics of a building. VRF Air Conditioning These types of system are similar to the Multi type; however they have an increased duty enabling the conditioning of large areas. These systems are also available as Heat Recovery Systems which have the additional advantage of being able to transfer the energy already present within a building to condition other areas and in return make further savings on energy bills. If you are looking for a quick method of cooling an area it may be possible to utilise a portable air conditioning system as an efficient and effective means of resolving the problem. We offer the sales and installation or hiring of portable air conditioning, please click on the link above for more information. Refrigeration systems are available in a variety of forms, ranging from a single cabinet fridge, to blast chillers and large scale freezer applications. We are able to provide a variety of refrigeration solutions to meet a vast range of requirements in the commercial environment. Whether you are looking for the ability to extract stale air from small area or provide a tempered supply and extract fresh air system within a large scale office environment, we are able to design and specify a solution to meet your requirements. Close Control Systems Some areas require increased levels of sensitivity and the ability to maintain close controlled levels of temperature and humidity. We are able to design systems to meet these demanding parameters with the ability to be incorporated into a vast range of environments.